"Mad, Bad, and Dangerous To Know." Note: "Mad, Bad, and Dangerous To Know ..."
This is what Lady Caroline Lamb wrote in her diary in March of 1812, just after she first met Byron. 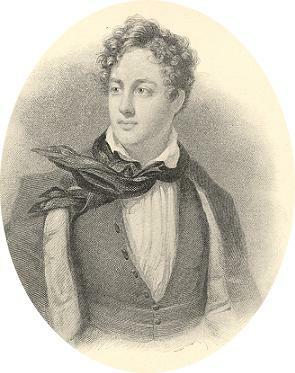 Note: The lead portrait of Byron contained at the top of this page, is from the painting by G. Sanders and as was presented by Byron to his publisher, John Murray. We have three others which one may wish to view: that by Thomas Phillips, by Richard Westall, and by that engraved by R. Whitechurch based on the portrait by Thomas Philips.